Adelina Amouteru’s heart has suffered at the hands of both family and friends, turning her down the bitter path of revenge. Now known and feared as the White Wolf, she and her sister flee Kenettra to find other Young Elites in the hopes of building her own army of allies. Her goal: to strike down the Inquisition Axis, the white-cloaked soldiers that murdered her love, the Crown Prince Enzo Valenciano. This book is going to be all kinds of amazing. 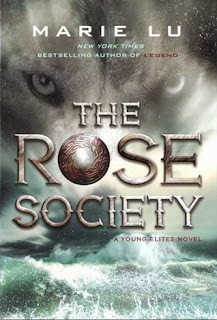 Well, I hope it will be :D As I really loved the first one, The Young Elites. But it ended so mean. And so evil and heartbreaking. And ugh. I'm so worried about this sequel. Yet oh so excited. I cannot wait to read more from this awesome world :D So excited. Wishing it was October already. <3 I pretty much adore Adelina. Can't wait to read more about her. Dying for this. What are you waiting for on this fearful Wednesday? I still need to read The Young Elites but I hope to get to it before this one is released! I hope you'll love this one sweetie! I so want this book. This book sounds amazing. I hope that you love it. This is on my wishlist too. Hope you get a chance to read it soon. The wolf alone that is on this cover make me want to start this series. Great pick! Ohh, I still haven't read The Young Elites! I want to, but you know, so many books, so little time and all that. :) I loove the look of this one, though. :) I hope you love it when you read it, Carina!